For decades, Focus on the Family has provided wonderful resources for Christian families. Their magazines for kids are some of my favorites. 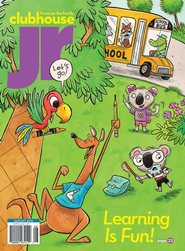 Clubhouse Jr. Magazine is designed for children ages 3-7, and Clubhouse Magazine is designed for children ages 8-12. The monthly magazines are filled with creative stories, delightful poems, interesting articles, crafts, puzzles, jokes, and more. Beautifully illustrated, the magazines reinforce biblical values as boys and girls explore their world through the pages. I was thrilled when the editors at Clubhouse Jr. accepted my submission for a comic page that would become a monthly feature. With the help of my creative daughter, I proposed a comic page called Friends Out Back, featuring a Koala Bear family with Koko and Lola who are brother and sister. Their friends Platty (a platypus) and Boomer (a kangaroo) stop by often to play games or explore the outback. Parrot is the comical side-kick who adds fun and humor to the page. I provide the words, and illustrator Stacy Curtis is the talent behind the pictures. A magazine subscription is a great gift idea if you have children you love to buy for. It’s the “gift that keeps on giving” as children receive their issue every month in their mailboxes—and how exciting is that! In our electronic age of e-books and online magazines, I am grateful that Focus on the Family continues to publish magazines that children can hold in their hands and turn the pages. Here’s to monthly surprises in the mailbox!